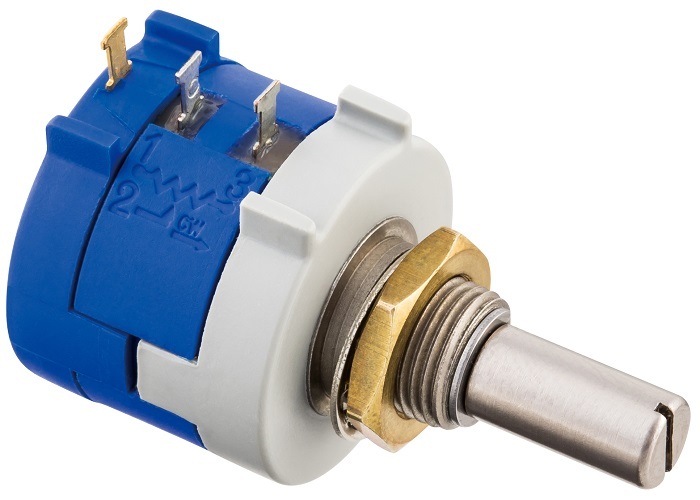 W-w Potentiometer uses a resistive element which looped copper nickel or nickel chrome resistive wire evenly around the cable core or card core. Combination of the resistive element and a noble metal alloy wiper maintains the precision and steady performance. Depending on the pitch of coil and diameter of the resistive wire, it is feasible to set the resistance value from a few ohms to a few hundred ohms. Comparing to other resistive elements, contact resistance is low. It is feasible to add center tap anywhere that you need within the total electrical travel. 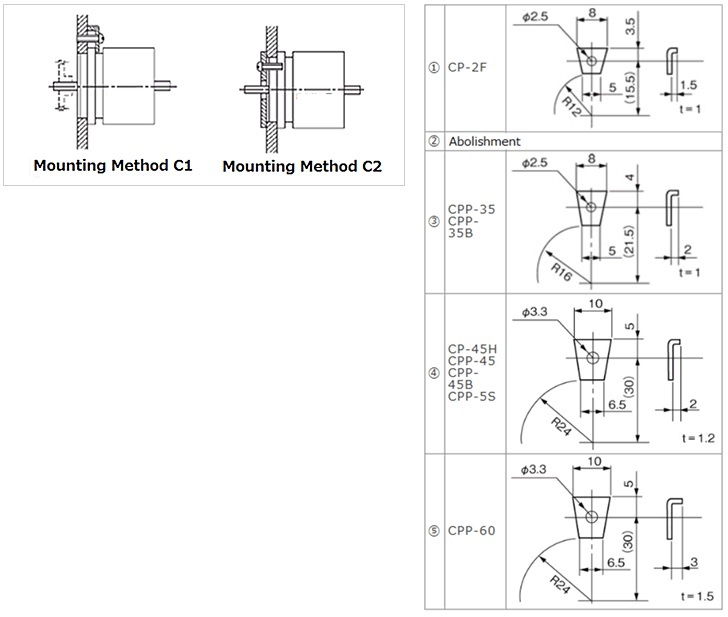 Sliding method of wire wound potentiometer is different depending on the number of terns and the type of resistive wire. Resistive Part: Coiled resistive wire and alloy spring plate or hog-backed metal plate as a sliding wiper. Corrector Part: Combination of a noble metal alloy spring ring and a collector spring. Resistive Part: A helicoidal coiled resistive wire. If finite load resistance is loaded on sensor output, linearity will become distorted as expressed in the following equation. JEITA (Japan Electronics and Information Technology Industries Association) recommends that the added load resistance should be more than 100 times of the total resistance. The higher the load resistance, the less effect of electrical noise on the output of the potentiometer. It is also effective in increasing the durability of the Green Pot. It is necessary to decrease the rated dissipation by the condition of the (1) Operating Temperature, (2) Load Resistance, (3) (4) Specifications to avoid damaging resistive element. Maximum input voltage (V) defined by the rated dissipation can be calculated by using the following formula. It is an area of the resistive element where the area has fixed output voltage ratio. The area is not included in the total effective electrical travel. Depending on the process of resistive element, extra segments might be added out side of the total electrical angle. 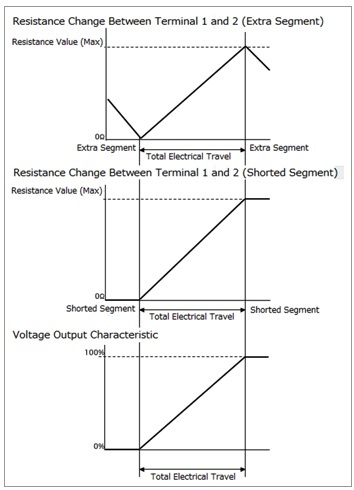 Voltage output characteristics of short segment and extra segment are both the same but in reading resistance value, there is difference as shown in the below charts. In extra segment, it is necessary to place terminals at the designated angle. If Green Pot is used in an environment with vibration or dither operation, resistive element may become partially worn by a sliding wiper causing shorter lifetime of the Green Pot. Contactless sensor such as Blue Pot and Orange Pot are more suitable for those kinds of operating environment. Potentiometer is used for obtaing output voltage ratio from input voltage. Therefore, apply DC voltage (Vin) and read out the voltage (Vout) between output terminal and GND. Do not use potentiometer as a variable resistor. We recommend to add load resistance that is more than 100 times of the total resistance value. If added load resistance is low, current flow at power-supply line (Terminal 1 to 3 or lead wire black to red) will flow to the output line (Terminal 1 to 2 or lead wire white to red) and may cause burnout of resistive element when wiper at low-value resistance position. 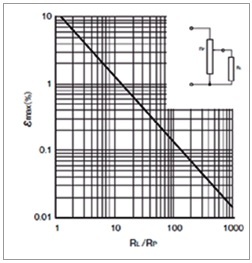 To avoid burn-out the resistive element, set wiper current lower than 1mA. If output terminal (or output lead wire) is connected to power-supply line, it will increase the chance of burning out the resistive element. 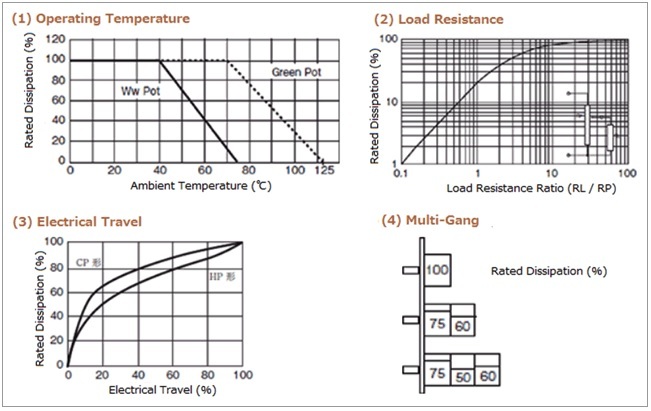 When checking total resistance or measuring resistance value of Green Pot by analog multimeter, increase the range of the analog multimeter to make the needle move widely and higher current flow may be generated. Please use analog multimeter with lower range than 1mA or we recommend to use the digital multimeter. If over voltage such as surge is supplied to potentiometer, it will cause burnout of the resistive element.